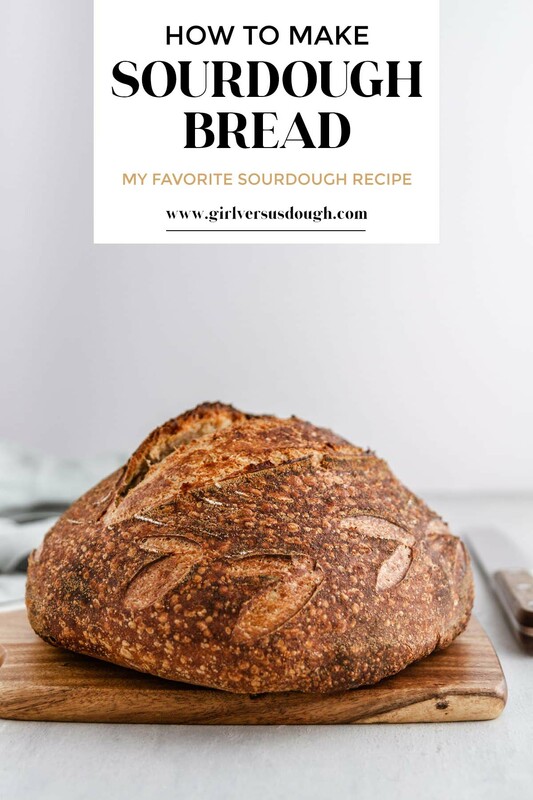 Welcome to the next post in our series, “How to Make Sourdough Bread.” Today’s post features my favorite sourdough bread recipe complete with step-by-step photos, definitions to sourdough baking terms and a sample baking schedule within the printable recipe. 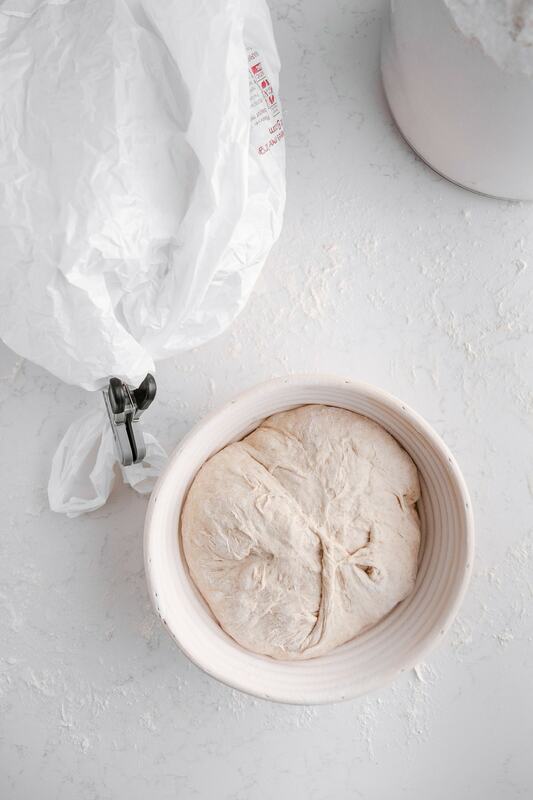 Follow along and in no time, you’ll have fresh homemade sourdough bread in your own kitchen. Happy Monday! Today, I’m going to walk you through the entire process of what is my favorite sourdough bread recipe. 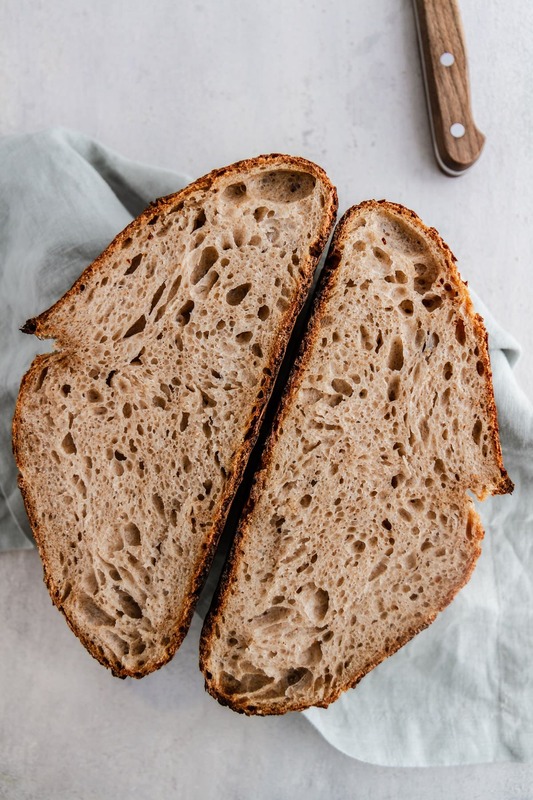 I’ve tried several variations of sourdough bread recipes and this one is by far the easiest and most foolproof recipe that yields the best results. This recipe is adapted from The Perfect Loaf’s high hydration sourdough bread. I’ve made just a few slight changes based on my own personal experience with this recipe, but you can also refer to his post for added insight. 1. There are several terms you’ll come across in this post that might sound like gibberish to you at first – levain, autolyse, bulk fermentation, etc. Don’t worry! I’ll explain everything. 2. You can use any sourdough starter to make this recipe (including storebought), but my experience with this recipe has always been with my sourdough starter recipe. 3. I have always found it incredibly helpful to take notes in a notebook as I go through my sourdough baking processes. This way, I know exactly what measurements I used, final temperatures of the ingredients and dough, timing of each step and the end result in terms of taste, crumb, texture, etc. If I have a written record of this process, I know what I can adjust for the next round. 4. Please refer to my essential sourdough tools post for all kitchen tools I use in this sourdough bread recipe. 5. Please refer to the sample baking schedule in the printable recipe at the bottom of this post for example times on when to prepare each step of the recipe. This is super helpful to make sure you have the timing right and can be available to make sourdough bread! 6. In your sourdough baking journey you’ll come across the term “hydration.” This recipe in particular is at an 80% hydration level, defined by the total amount of water divided by the total amount of flour. This post on Sour Flour explains it really well. OK, I think we’re ready. ONWARD. For our first step, we will prepare the levain. 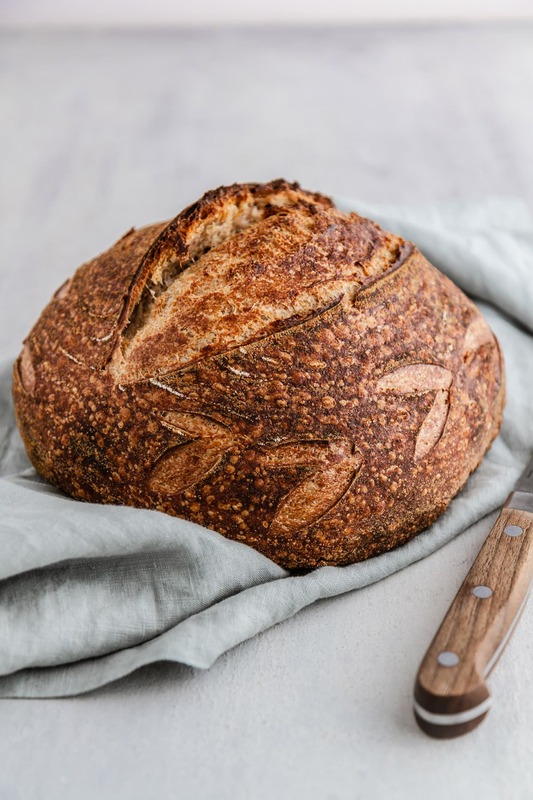 Levain is actually the French term for a sourdough starter, but in this case, levain is also the mixture we use to feed a portion of our already-mature starter so it has the strength to give the bread lift, flavor, texture, etc. In other words, it’s what makes sourdough, well, sourdough. 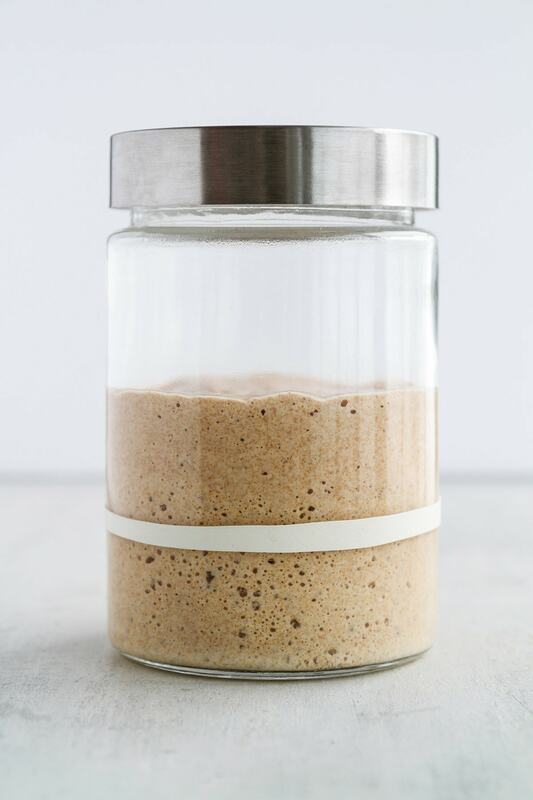 To prepare the levain: Place a clean starter jar on a kitchen scale. Tare the scale so it reads “0”, then to the jar add 50g of your mature starter, 200g whole wheat flour and 200g distilled water at room temperature. Stir the mixture vigorously until no dry bits of flour remain, then cover the starter jar loosely with a lid. Leave the levain in warm place (such as the oven with the light turned on) for approximately 12 hours*, until it has more than doubled in size (aka reached its “peak”). You’ll know the levain has reached its peak when it has grown considerably in size, there are bubbles all throughout, the top of the levain is not domed but instead very flat or even beginning to cave in on itself and there is a pleasant sour smell to it, not off-putting or too vinegar-y. *NOTE: Please refer to the sample baking schedule in the printable recipe at the bottom of this post for a guideline of exact times on when to prepare each step! Now you’re probably wondering: After I make the levain, what do I do with the remaining starter? Well, let me tell you. IF YOU PLAN TO BAKE BREAD ON AN ALMOST DAILY BASIS: Place a clean starter jar on a kitchen scale. Tare the weight so it reads “0”, then to the jar add 20g of your mature starter, 50g whole wheat flour, 50g all-purpose flour and 100g distilled water at room temperature. Stir the mixture vigorously with a spatula until no dry bits of flour remain, then cover the jar loosely with a lid. Leave the starter in a warm place for 12 hours. Discard your excess starter. Repeat the feeding process approximately every 12 hours twice daily (ex. 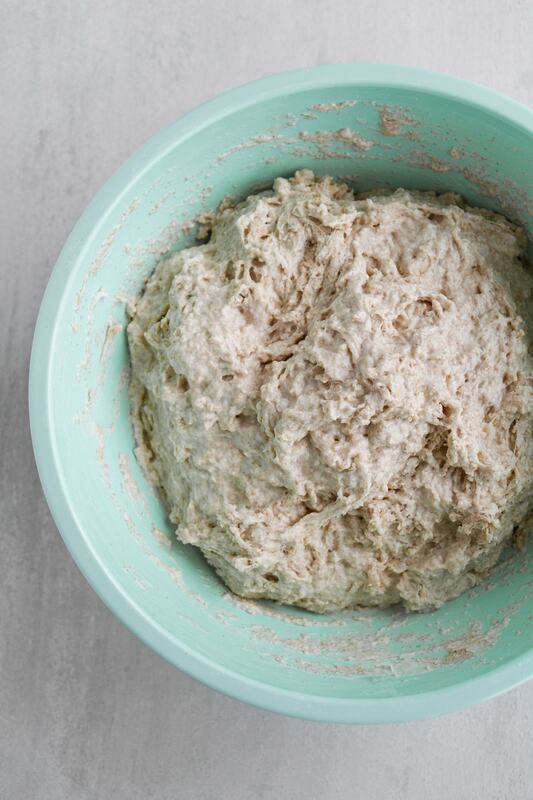 8 a.m. and 8 p.m.) until you want to make sourdough bread again. IF YOU PLAN TO BAKE BREAD ON A WEEKLY BASIS: Place a clean starter jar on a kitchen scale. Tare the weight so it reads “0”, then to the jar add 20g of your mature starter, 50g whole wheat flour, 50g all-purpose flour and 80g distilled water at room temperature. Stir the mixture vigorously with a spatula until no dry bits of flour remain, then cover the jar loosely with a lid. Let the starter sit out at room temperature for about an hour, then place it in the back of your fridge (where no one will touch it or, heaven forbid, accidentally throw it away). In nearly one week’s time (about two days before you plan to bake another set of sourdough loaves) in the early evening (say, about 6 p.m.), take the starter out of the fridge. Let it come up to room temperature (about 2 hours), then feed it as follows (at about 8 p.m.): Place a clean starter jar on a kitchen scale. Tare the weight so it reads “0”, then to the jar add 20g of your mature starter, 50g whole wheat flour, 50g all-purpose flour and 100g distilled water at room temperature. Stir the mixture vigorously with a spatula until no dry bits of flour remain, then cover the jar loosely with a lid. Store the starter in a warm place for approximately 12 hours, then repeat the feeding process (at about 8 a.m.). Continue to repeat the feeding process every 12 hours (8 a.m., 8 p.m.) until the starter has regained its full strength and you’re ready to bake. On average, I feed my starter four times this way before preparing the levain. If you plan to bake bread even less often than weekly, I suggest reading this post on sourdough starter storage options. I don’t yet have personal experience with storing my starter this way. The autolyse stage is a fancy term for when the flour and water for the dough are mixed together and take a rest. This rest time is short and helps for all the ingredients to come together better. That’s the very unofficial way to explain it. Before we make the dough mix for the autolyse, however, we need to measure the temperature of the levain. Use an instant-read thermometer to measure this temperature, then write it down. Also write down your kitchen’s ambient temperature, as well as the temperature of your flour (which is usually the same temperature as your kitchen’s ambient temperature). These numbers will come in handy shortly. OK, onward! Approximately 11-ish hours after preparing the levain (see the sample schedule in the recipe for specific times! ), place a medium to large mixing bowl on a kitchen scale. Tare the weight so it reads “0”, then to the bowl add 250g of the levain (you may have some left over to discard, or you may have none) and 750g distilled water at room temperature. Stir the mixture with a wooden spoon or spatula until the levain is completely dissolved in the water, then add 800g bread flour and 200g whole wheat flour. Mix the dough with a spatula or, more effectively, with your hands until completely mixed together and no dry bits of flour remain. It’s a messy process when you use your hands, but you’ve gotta just get in there. Once the dough is mixed, cover the bowl loosely with plastic wrap and place the bowl in a warm spot in your kitchen (such as the oven with the light turned on) for 50 minutes. While the autolyse occurs, let’s do some math to determine what temperature the remaining water should be that we’ll add to the dough mix. This is where those numbers you recorded for the levain, flour and room temperature come into play. For sourdough, we want to achieve a final dough temperature of 78 degrees F precisely for all things to work together well. Temperature is so important in sourdough baking, it must be treated like another ingredient. 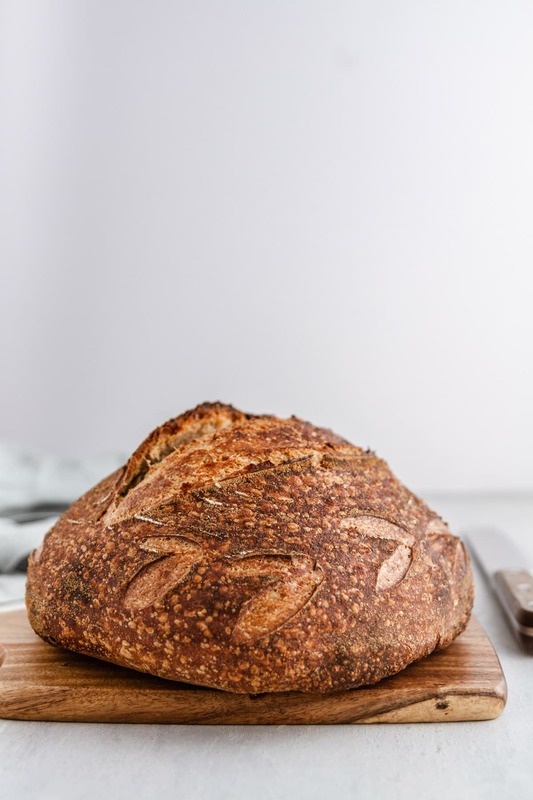 To determine the temperature you need for the remaining water, use The Perfect Loaf’s temperature calculator and plug in the numbers for the levain, flour and room temperature you recorded. This will give you the exact temperature you need to achieve 78 degrees F in your final dough temperature. Once the dough has finished its autolyse, place the bowl on a kitchen scale. Tare the weight so it reads “0”, then to the bowl add 20g fine sea salt and 50g distilled water AT THE MEASURED TEMPERATURE YOU JUST CALCULATED. For me, sometimes this equates to 97 degrees F, or 92 degrees F, or even 102 degrees F. It really varies, but the point is: Don’t skip this step. It seems tedious, but a FDT of 78 degrees F is important for the best result possible. Once the salt and water are added, get your hands messy again and stir the dough mix together with your hands until everything is completely incorporated. 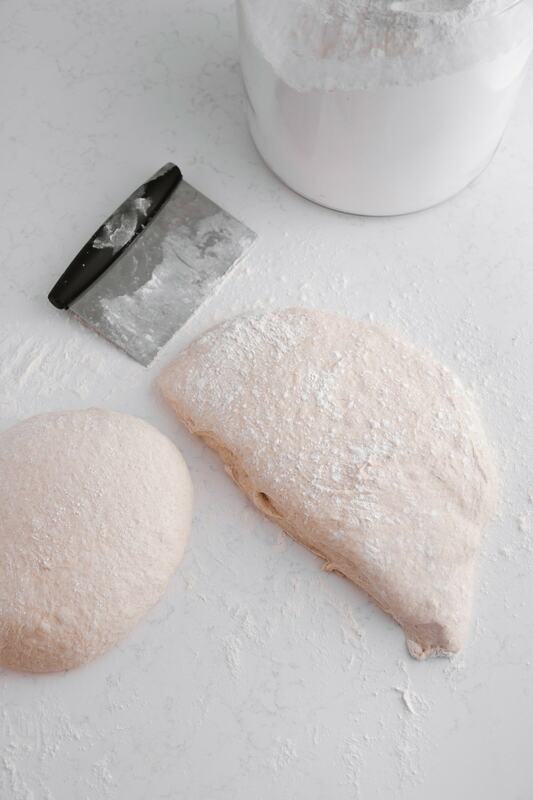 Transfer the dough to a clean, large bowl. Cover the bowl with plastic wrap and return it to its warm place. Bulk fermentation is a proper way of saying “the time when the dough does its rising and, well, fermenting.” This is the time when the dough gains strength and height, and we’ll help it along to do so. Here’s how. Approximately 30 minutes after mixing the dough, uncover the bowl and perform a set of four turns. This means you take both hands, lift up the end of the dough farthest from you as high as you can lift it without tearing, then fold it over on itself towards you. Turn the bowl 180 degrees, then repeat. Turn the bowl 90 degrees, then repeat. Turn the bowl another 180 degrees, then repeat. This is ONE SET of turns. P.S. Head to my Sourdough highlight in my Instagram Stories to see a video on how I perform a set of turns. Once the set is complete, cover the bowl again with plastic wrap and return it to its warm place. We will repeat these sets of turns six times every 30 minutes total (see the sample schedule in the recipe for an example on timing), then let the dough rest covered without any turns for another 1 hour 30 minutes. This means bulk fermentation in total takes approximately 4 hours 30 minutes. At the end of bulk fermentation, your dough should be strong, grown in size anywhere from 20 to 50 percent and have a few gas bubbles sprinkled throughout. This is good news! Once bulk fermentation is complete, we need to preshape the dough before actually shaping it (ha). The most important tip to know here is that we want to manipulate the dough as little as possible to keep those gas bubbles intact. Using a spatula to help coax it out, gently remove the dough from its bowl onto a well-floured surface. Use a bench scraper or sharp knife coated in flour to divide the dough in two equal size pieces. 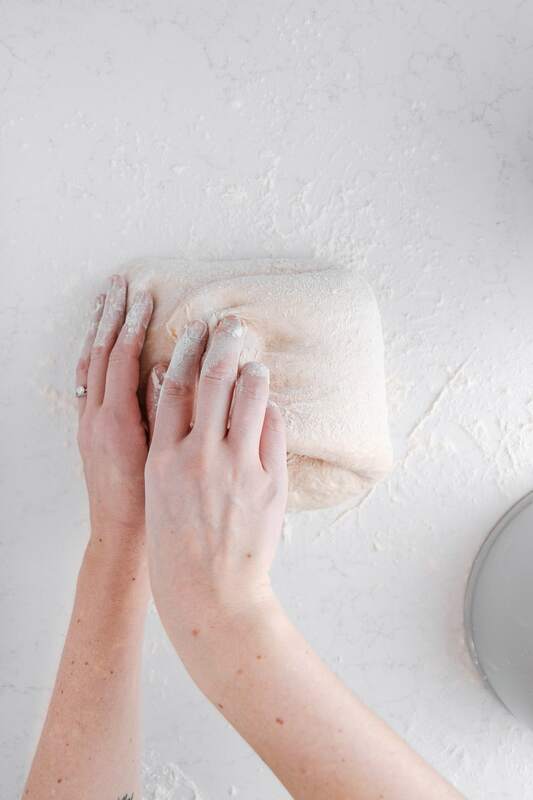 Cover your hands with flour and, as gently but as quickly as possible, rotate one piece of dough with your hands while leaving it on or close to the surface, shaping into a tight round. I usually cup my hands and gently pull the dough under itself as I turn it to create a round shape with a tight surface. Repeat this process with the second piece of dough. Cover each piece of dough with a bowl and let them rest on the counter untouched for 30 minutes. While the dough is in its preshape phase, let’s prep the bowls/baskets for the overnight proof. I like to spray the banneton basket or linen for lining the bowl(s) with a little bit of water (basically, just get them lightly damp), then sprinkle them evenly with a light coating of white rice flour. White rice flour is the best option for the bowls because it gives you the best chance of making sure the dough doesn’t stick to the lining. Once that step is done, I set them off to the side until we are ready to shape. About 30 minutes after preshaping, uncover one piece of dough. Gently turn it over and place it on the surface. Using both hands, lift up the top half and fold it over about 3/4 of the way over itself. Grab the right side of the dough; stretch it out to the right and then fold it over the dough. Grab the left side of the dough; stretch it out to the left and then fold it over the dough. 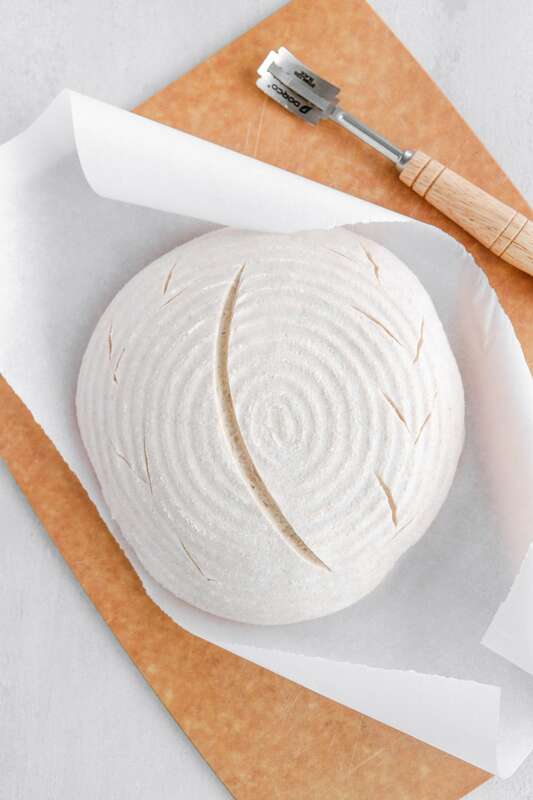 Take the bottom half of the dough, lift it up and fold it completely over the dough to form a “letter.” Turn the dough over so the seam is on the bottom, then gently rotate the dough in your hands a few times to form a tight round, aka a boule. Repeat with the second piece of dough. 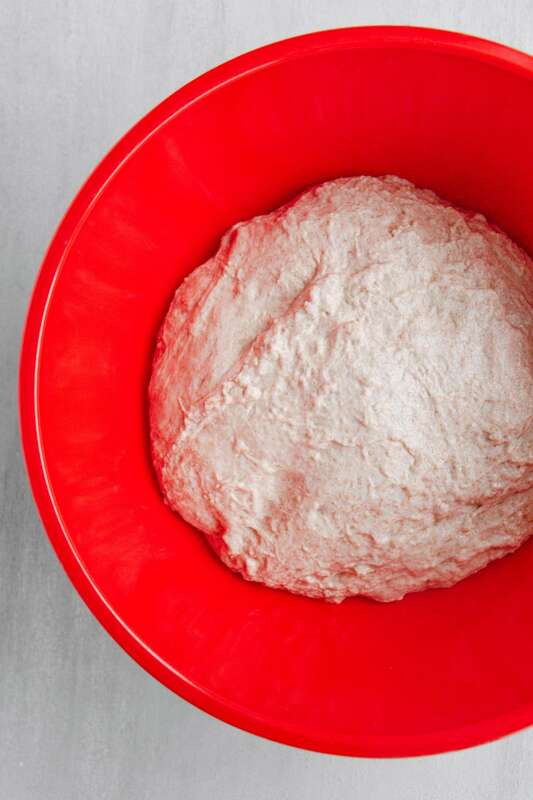 Gently transfer each piece of dough, seam side-UP, to a prepared basket/bowl. Sometimes, if I feel the dough is really slack, I’ll gently pinch the edges of the dough into the center once it is in its basket to help it maintain its shape. Cover each bowl with a plastic bag, then seal with a clip, rubber band, etc. to avoid as much refrigerator air flow as possible. Let the dough sit in the bags at room temperature for about 20 minutes, then transfer to the fridge for an overnight proof, approximately 15-16 hours. The next morning, place an oven rack on the bottom third of your oven (if you’ve got a starter stored in there, move it for the time being!). Place the deeper side of your combo cooker facing down and the shallow side facing up next to each other on the rack (if you’re using a Dutch oven, place the cover facing down and the pot part facing up next to each other on the rack). Preheat the oven to 510 degrees F for one hour. When the oven is fully preheated, remove one piece of dough from the fridge. Place a sheet of parchment paper on top of the basket. Top the parchment with a cutting board. 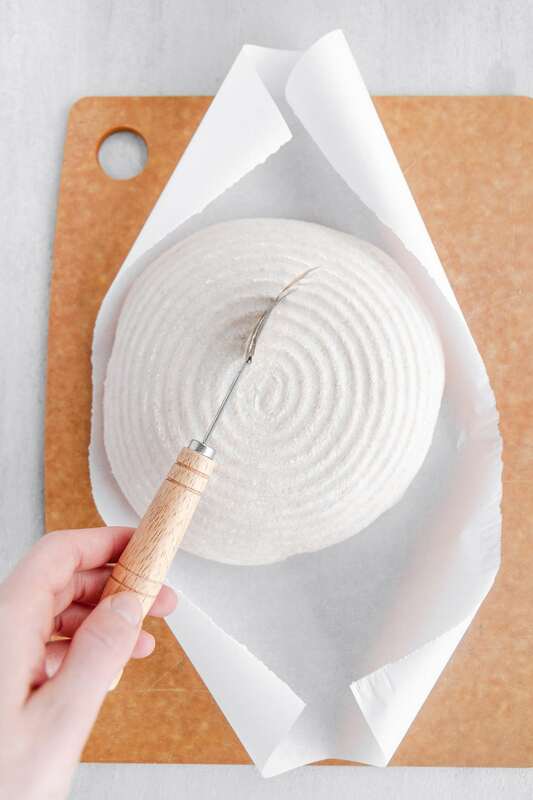 Gently but quickly invert the basket with the cutting board so the dough lands on the parchment paper on the cutting board. Remove the basket. Use a bread lame to score the top of the loaf. 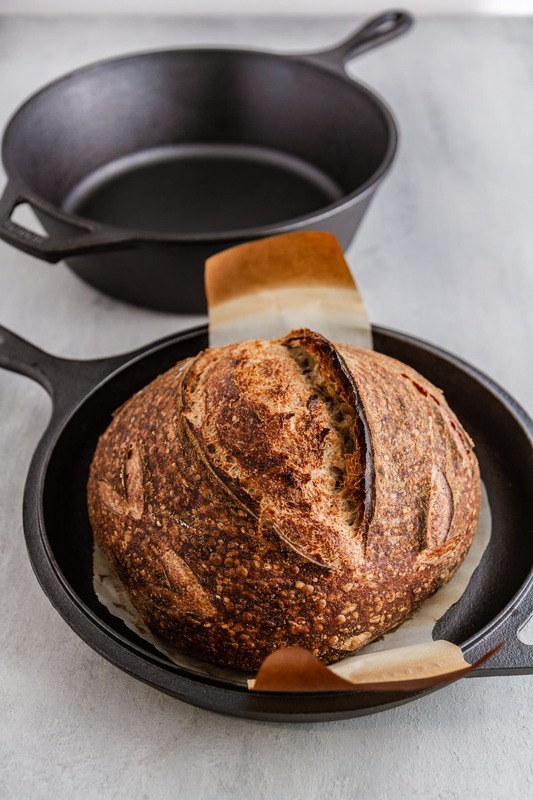 You want to score straight into the loaf about a quarter-inch deep, and do enough scoring to allow for steam to escape from the dough and for the oven spring to occur (basically, you don’t want the dough to tear unattractively in the oven as it expands). Feel free to get creative here, or keep it simple! A box cut is always a good beginner choice. Here’s a tip I learned from Laura of A Beautiful Plate: to avoid the parchment paper from crinkling inside the combo cooker/Dutch oven, thereby sometimes giving the bread a weird shape, cut the paper around the dough leaving two “handles” that can poke out of the sides of the cooker in the oven. This helps to transfer the dough to and from the cooker. Using oven mitts, carefully slide the dough on the parchment paper into the shallow side of the combo cooker (or the pot of the Dutch oven). Cover with the deep side of the combo cooker/lid of the Dutch oven, and place in the oven. Reduce the oven temperature to 500 degrees F.
Bake at 500 degrees F covered for 20 minutes, then reduce the temperature to 450 degrees F and continue to bake, covered, for 10 minutes. Uncover the dough (place the top of the cooker/Dutch oven next to the dough in the oven to keep it hot) and continue to bake another 25-30 minutes until the bread is a deep, dark golden brown and baked through. An instant thermometer inserted in the center of the loaf should read around 210 degrees F when it’s fully baked. 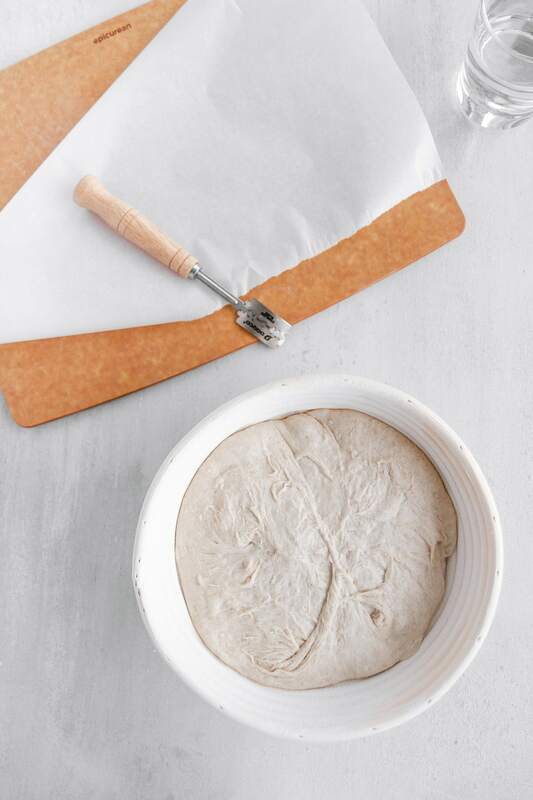 Use the parchment paper to transfer the bread to a cooling rack to cool completely. Repeat the scoring/baking process with the second piece of dough. Here’s an important tip: I know this is tough to do, but let the bread cool completely before slicing into it! If it’s even the least bit warm, a knife cutting into the bread can make it squish together and “gum up,” which is just sad for everyone. Be patient and you’ll be rewarded! The finished bread, when baked correctly, should have a decent height, a caramelized dark brown exterior, a slightly open crumb, a fluffy but stable interior and a delicate, crisp crust. It should taste like unicorn sprinkles rained down from heaven – or just really, really good. And guess what? YOU BAKED THAT. You are a wizard. Below is my a printable recipe that includes a sample baking schedule for my favorite sourdough bread. This is just a guide – feel free to adjust to fit your schedule, but keep the division of time the same. Friends, if you’ve made it this far, you are fully committed and I am so happy about that. As always, please ask questions in the comments below, e-mail me or send me a message on Instagram or Facebook. I am here for you! Remember, this is a long journey that takes practice, so be patient and have fun. WANT MORE KNOW-HOW ON SOURDOUGH? Head to my next post, Sourdough Baking Tips and Resources. At 9:15 p.m. 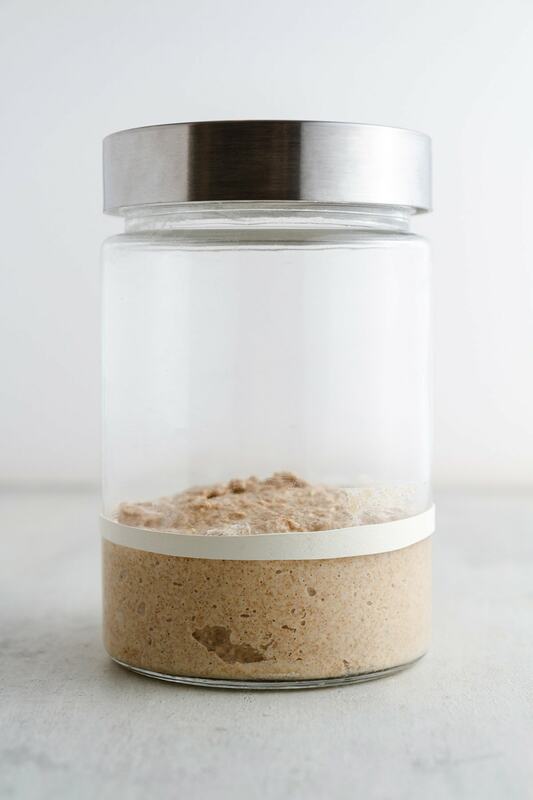 PREPARE LEVAIN: Place a clean starter jar on a kitchen scale. Tare the weight so it reads “0”, then to the jar add 50g mature starter, 200g whole wheat flour and 200g distilled water at room temperature. Stir the mixture vigorously until no dry bits of flour remain, then cover the jar loosely with a lid. Store in a warm place (such as the oven with the light on) for approximately 10-12 hours. At 8:30 a.m. (next day) PREPARE AUTOLYSE: The next morning, place a medium to large mixing bowl on a kitchen scale. Tare the weight so it reads “0”, then to the bowl add 250g levain and 750g distilled water at room temperature. Stir the mixture until the levain is completely dissolved. Add 800g bread flour and 200g whole wheat flour. Mix with your hands until mixture is completely incorporated. Cover bowl with plastic wrap and place in a warm place (such as the oven with the light on) for 50 minutes. At 9:20 a.m. FINISH THE DOUGH MIX: To the mixing bowl add 20g fine sea salt and remaining 50g distilled water (at temperature calculated as described in post to achieve final dough temperature of 78 degrees F). Mix with your hands until mixture is completely incorporated. Cover bowl with plastic wrap and place in a warm place (such as the oven with the light on) for 30 minutes. At 10 a.m. BULK FERMENTATION: After 30 minutes have elapsed, perform the first set of turns (see post for full description on how to perform a set of turns). Cover the bowl and return it to its warm place. At 10:30 a.m. Perform second set of turns. Cover and return to warm place. At 11 a.m. Perform third set of turns. Cover and return to warm place. At 11:30 a.m. Perform fourth set of turns. Cover and return to warm place. At 12 p.m. Perform fifth set of turns. Cover and return to warm place. At 12:30 p.m. Perform sixth and final set of turns. Cover and return to warm place to finish bulk fermentation, untouched. 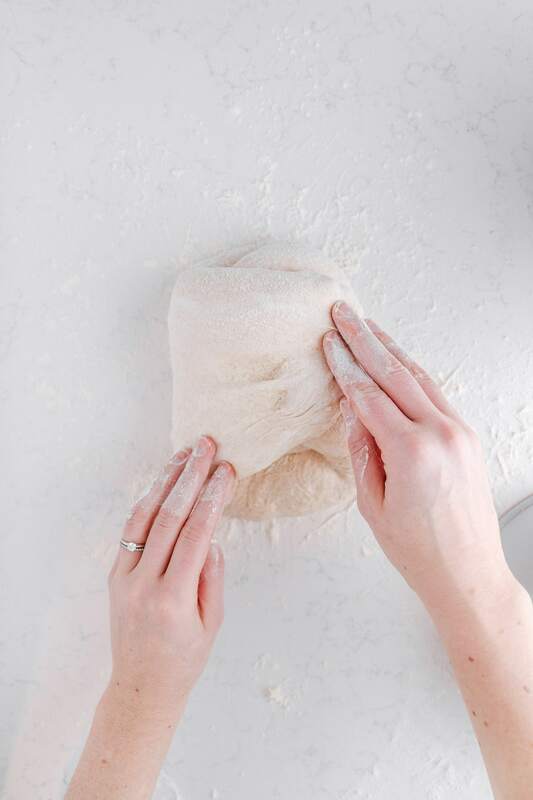 At 2:00 p.m. PRESHAPE: Gently transfer dough to a well-floured surface. 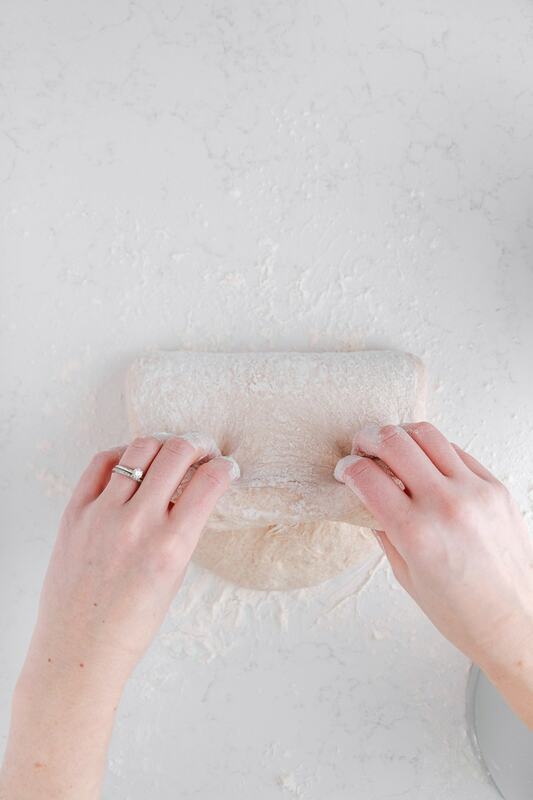 Using a well-floured bench scraper or knife, divide dough into two equal pieces. 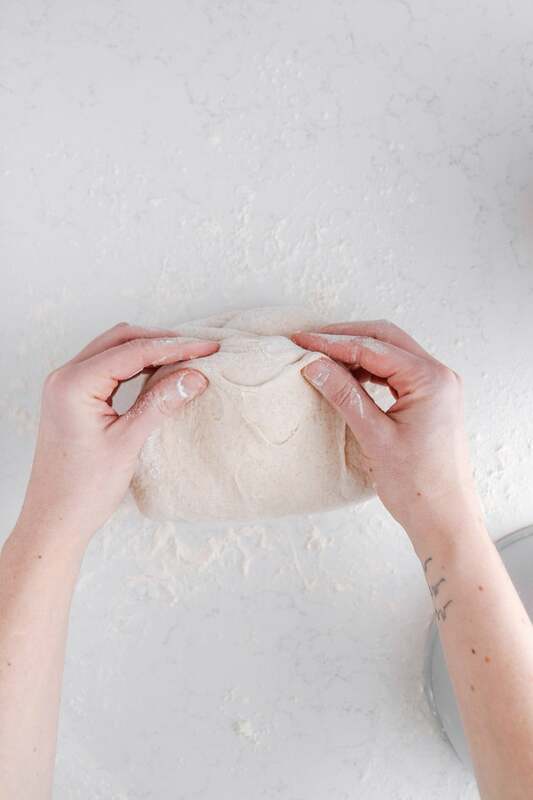 Use floured hands to gently but quickly shape each piece of dough into a tight round (see post for full description on preshape). Cover dough with bowls and let rest on counter for 30 minutes. At 2:30 p.m. SHAPE AND PROOF: Lightly dampen and dust two banneton baskets or linen-lined bowls with white rice flour. Remove bowls from dough. Shape dough into boule (see post for full description on how to shape into a boule). Carefully transfer dough to one prepared basket. Repeat with second dough. Cover each basket with a plastic bag; use a clip to seal bag. 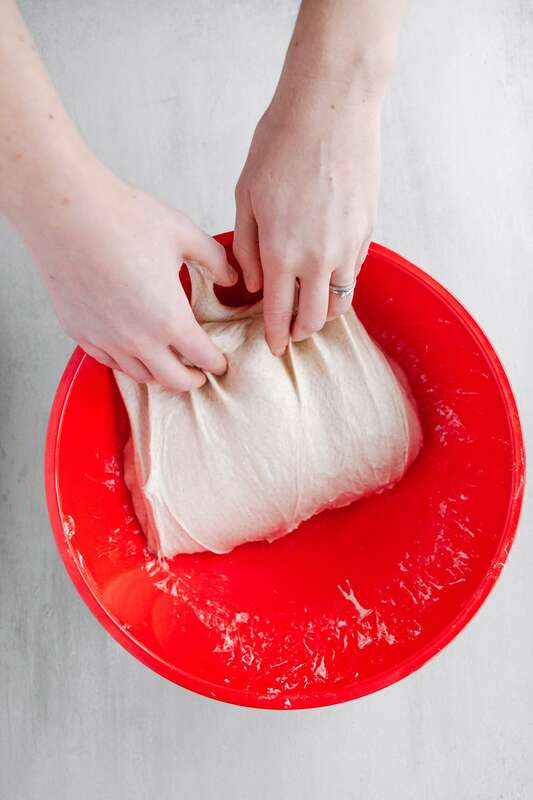 Let dough rest in bags at room temperature 20 minutes, then transfer to refrigerator for an overnight proof. At 7:30 a.m. (next day) PREHEAT: Place an oven rack on bottom third of oven. Place deep side of combo cooker facing down on one side of oven rack; place shallow side of combo cooker facing up on other side. Preheat oven to 510 degrees F for 1 hour. Remove one dough from refrigerator and plastic bag. Place a sheet of parchment paper and a cutting board on top of basket. Carefully invert basket with cutting board so dough lands on parchment paper. Remove basket. Use a bread lame to score top of dough. At 8:30 a.m. BAKE: Using oven mitts, carefully slide dough on parchment paper to shallow side of combo cooker. Place deep side of combo cooker on top to seal. Reduce oven temperature to 500 degrees F. Bake covered 20 minutes. Reduce oven temperature to 450 degrees F. Bake covered another 10 minutes. Using oven mitts, remove top of combo cooker and return to oven rack in oven to keep hot. Bake bread uncovered another 25-30 minutes until a deep golden brown (an instant thermometer should read an internal temperature of approximately 210 degrees F). Transfer bread to a cooling rack to cool completely, about 1 hour 30 minutes. Repeat with second loaf. 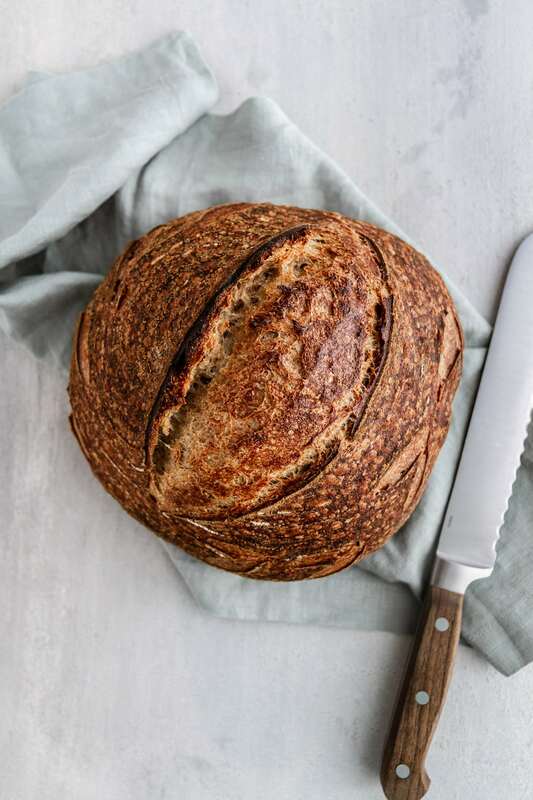 Hi – Thanks for this series as I’m on a sourdough journey at the moment as well! I have 2 questions for your Q & A. First, do I need to do a test (aka the “poke test”) on the dough after the final rise to determine if it is ready to bake? Next, is it possible to do a video of your dough shaping with this hydration level? I’ve tried lower hydration breads and still cannot seem to get this part right. 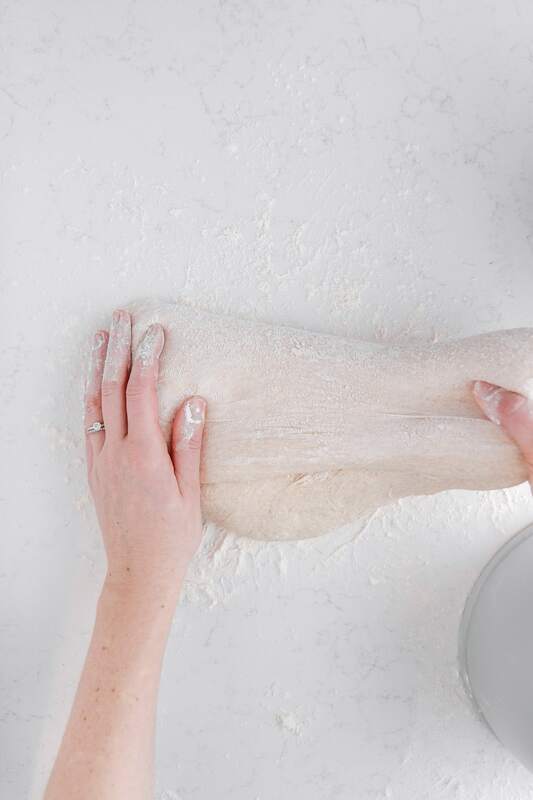 My dough never stays as a round – it always wants to sag over my hands when picking it up. Ok, I think that’s all for now! Thanks! Hi again Lori, just wanted to let you know I just posted in my Instagram stories a video on how to shape sourdough into a round! You can access it in the “Sourdough” highlights section of my Instagram profile. 🙂 Hope it is helpful! Love this series! I saw your sourdough journey on your story a few weeks ago and it inspired me to try on my own! Thanks for the recent posts and the wealth of knowledge. Who knew it could be so intense?! Can’t wait to get baking! Ariel, thank you so much! It is so intense, but so fun, too. 😉 Happy baking! Such a gorgeous sourdough and what a great series!